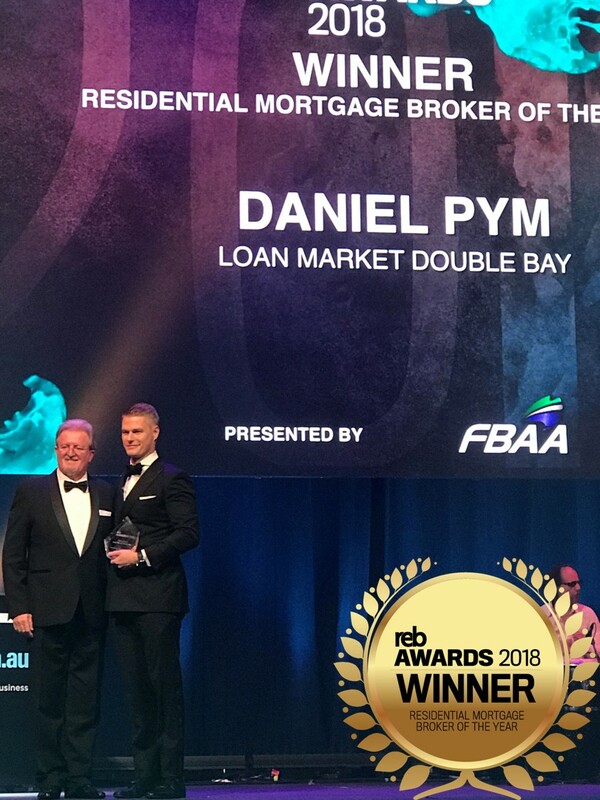 Loan Market Double Bay director Daniel Pym has received the prestigious title of Residential Mortgage Broker of the Year at the Real Estate Business (REB) Awards held Thursday 19 July at The Star, Sydney. The REB Awards celebrate the best in the real estate industry and Residential Mortgage Broker of the Year is a hotly contested category and the only award aimed at the broking side of business. Mr Pym said he was proud to receive the title, especially against such strong competition. “It is a privilege to accept this award and be recognised for the work I, and the team at Loan Market Double Bay, do for our clients, and each other,” said Mr Pym. Mr Pym works in partnership with the team at Ray White Double Bay in Sydney’s prestigious eastern suburbs to give clients a one-stop shop for their real estate and finance needs. Craig Pontey, Director of Ray White Double Bay said he was proud to work alongside Mr Pym and that the award was much deserved. “Daniel's leadership within the business is what sets him apart. The hours he puts in, the consistency and the high level of care he applies to all areas of the business is incredible. But what's most impressive is Daniel's relentless focus and dedication to the service of his customers,” said Mr Pontey. This isn’t the first title for Mr Pym - he is regularly recognised in the industry for his hardwork and dedication to his clients and the industry. In the last six months alone Mr Pym has won Best Residential Broker NSW at the Better Business Awards and be named a finalist at the Australian Broking Awards and the MFAA Excellence Awards. Mr Pym strives to save his clients time and money in everything he does. His proactive and in-depth customer service programme aims to look after his customers throughout their life stages. Mr Pym averages a turnaround time on applications of just 24 hours due to his high rating and strong connections he has in the industry. “It’s a huge reason why my clients use me - and return to work with me again,” says Mr Pym. The REB Awards are the benchmark of success in Australian real estate. The awards are the most sought-after business awards in the industry and seek to recognise the best operators across several categories. How a mortgage broker does more than find you a great rate.